We all wait for these months where the end of one festival blends into the beginning of the next. Across the country we are immersed in cleaning our homes, buying new clothes, making entertainment plans, and most important of all, trying out new recipes to serve family and friends. This is a time to treat our loved ones to great tasting, innovative food. Keeping this in mind, we have worked on a range of articles introducing recipes ranging from healthy starters to delectable desserts. 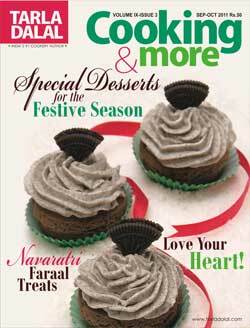 So, have a wonderful culinary adventure this festive season! Remember not to overindulge however, difficult though it may seem. The trick is to include some low calorie food that’s light on the stomach, so that you don’t suffer the after effects of eating too many sweets or fried foods. Soups and salads are always a good bet, and we can help you whip up wholesome and budget-friendly soups, and salads and salad dressings that tempt the palate. Your health always comes first, be it during festivals or anytime of the year. Our panel of experts shares their knowledge on a variety of topics: Naini Setalvad reminds us how to eat healthy; Dr. Nupur Krishnan guides those undergoing dialysis on the right diet; and Dr. Lipsa Shah explains how to manage fibroids with us ayurvedic therapy. Like every year on World Heart Day I remind you to take care of your heart. Look after your body and take special care of your eyes, your most important sense organ, so that you can continue to view this wonderful world…and my recipes! Before I end I must tell you about my culinary journey from Rajkot to Mysore and Bangalore. I always enjoy demonstrating my recipes in various cities; it makes me feel good and refreshed, and I really look forward to the trips. My friends and team always encourage me to take up such challenges and that’s how I give my best!